The Original Dramatized King James New Testament has been heard and enjoyed throughout the entire English speaking world, and was sold by a great number of Christian bookstores across America. They were offered as a 16 cassette album, with over five hundred thousand album sets purchased. This production of the New Testament has been digitally re-mastered and enhanced for your listening enjoyment. Professional voices along with superbly selected music and sound effects, heighten the dramatic impact of this magnificent audio presentation. Each book helps to make the word of God literally come alive for you or your loved ones..... Provides a rich and memorable listening experience! You now can hear divinely inspired truth in a sincere, compelling manner, enriching your spiritual life and adding new dimensions to your understanding. 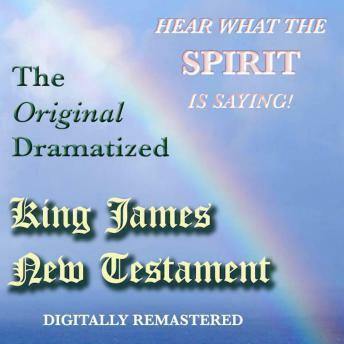 This Original KJV New Testament,Â on MP3 delivers! Read real reviews about our digital download of The Original Dramatized King James New Testament, available Here from Sound Life, Inc.
A real gem. I had these earlier in my life and lost them along the way. It was a real joy to get this replacement. The dramatization and sound effects for this audio bible is the best I have heard in all the collections of dramatized audio New Testament out there. What I like most when listening to this story is when I hear the very words that Jesus spoke. The voice that portrays Him is so soothing and puts peace in my heart. the Greatest Story Ever Told (The Bible) become vivid and real in my mind. The many different expressions of the narrators, the music, the sounds of animals, makes me feel like I am part of the story and right there among the characters of the Bible. The first time I ever listened to this was over 30 years ago and I still remember in a particular part of the story where the hair on the back of my neck stood up and I had cold chills on my arms. It was amazing. Parts still put a lump in my throat and tears in my eyes every time I hear the words. I own this very copy of the Dramatized New Testament on 16 cassette tapes. I have been searching for years to purchase this again as my cassette tapes have become old and brittle, and many have broken. I feel blessed that this has resurfaced and I have finally located it. Best of all it is now digitalized and I can carry it on my cell phone where ever I go.